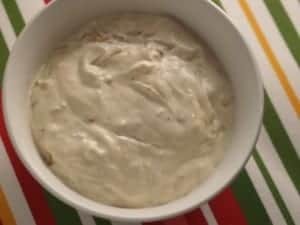 Home » CopyKat Recipes » Ina Garten’s Pan-Fried Onion Dip – the Barefoot Contessa takes Onion Dip to another level. Ina Garten’s Pan-Fried Onion Dip – the Barefoot Contessa takes Onion Dip to another level. Ina Garten’s Pan Fried Onion dip is so much tastier than any dip you will buy in a store. Try this dip soon, and it will be part of your regular rotation of party recipes. This is a rich and wonderful take on plain French onion sour cream dip we are so familiar with. This recipe is easy to make and would be perfect for a tailgate party. Carmelized onions taste so much better than what you buy in the grocery store as the prepared dip, now this dip is good as soon as it is prepared. I think it would be better if you let it sit in the refrigerator for a couple of hours before serving, but honestly, it has never lasted that long at my house. Looking for delicious dips to serve? Ina Garten's Pan-Fried Onion Dip takes onion dip to a whole another level. Heat the butter and oil in a large sauté pan over medium heat. Add the onions, cayenne, salt, and pepper and sauté for 10 minutes. this is a very dangerous snack. i made my own toasty pita chips with sea salt..
the bowl was licked clean!